Europe may have a reputation as a mature and well-developed market, but it offers huge potential for New Zealand’s natural health products industry if New Zealand Extracts’ experience is anything to go by. 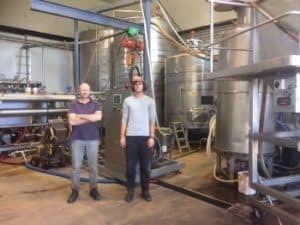 The company uses a cutting-edge proprietary water extraction technology for extracting bio-active ingredients from New Zealand-grown sauvignon blanc and pinot noir grapes, black-currants, boysenberries, kiwifruit and seaweed. The 100% natural extracts are used in a wide range of products, including dietary supplements, and digestive health, sports nutrition and personal care products made by companies in Asia/Japan, Australia, Europe, New Zealand and North America. Managing Director Mike Turner says New Zealand Extracts has undergone significant evolution and growth since its inception more than a decade ago when it solely focused on developing grape skin and seed extracts made from Marlborough wineries’ by-products. Since then it has expanded to process other types of locally-grown fruit and seaweed extracts and has also gained a European shareholder – something that has helped to catapult the company onto a faster and even more exciting trajectory. Mike says the European connection has opened new doors for the business and opened his eyes to the huge potential the European market presents. Europe may be a more mature and well-developed market than Asia, but it is massive, motivated to buy New Zealand-produced products and its price point is far higher than is generally the case in Asia. He says there are exciting new opportunities in Eastern Europe: “Their affluence is growing and, as is generally the case in Europe, the market seeks quality and efficacy rather than low prices. This is the perfect proposition for New Zealand-made ingredients and finished products. Life is very busy for Mike and the four-strong New Zealand Extracts team. Even though it has only been two years since the business moved into a new production facility near Blenheim, the growing demand for its ingredients means further expansion is now needed.